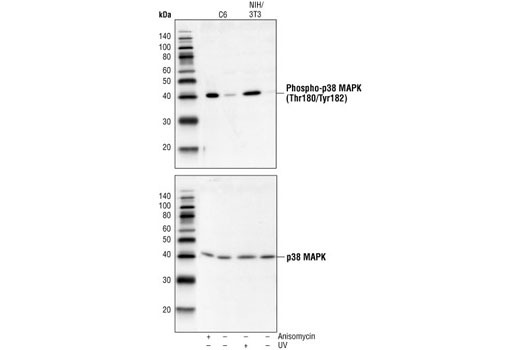 Western blot analysis of extracts from C6 cells, untreated or anisomycin-treated, and NIH/3T3 cells, untreated or UV-treated, using phospho-p38 MAPK (Thr180/Tyr182) Antibody #9211 (upper) or p38 MAPK Antibody (lower). 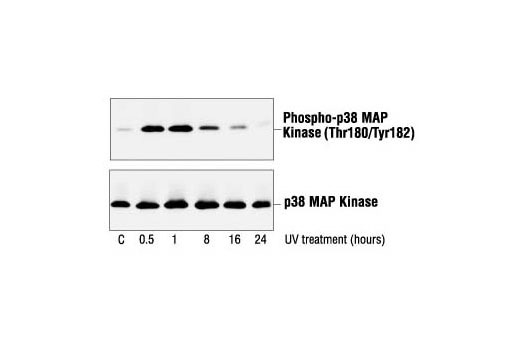 Western blot analysis of extracts from NIH/3T3 cells, untreated or UV-treated for the indicated times, using Phospho-p38 MAPK (Thr180/Tyr182) Antibody #9211 (upper) or p38 MAPK Antibody (lower). 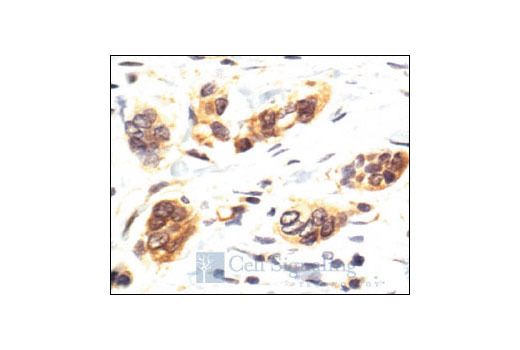 Immunohistochemical analysis of paraffin-embedded human breast carcinoma, showing nuclear and cytoplasmic localization, using p38 MAPK Antibody. Confocal immunofluorescent images of HeLa cells-/+ UV light labeled with #9212 p38 MAPK (green) exhibiting cytoplasmic localization in untreated cells (left) and nuclear localization in treated cells (right). Red = Actin filaments (phalloidin). 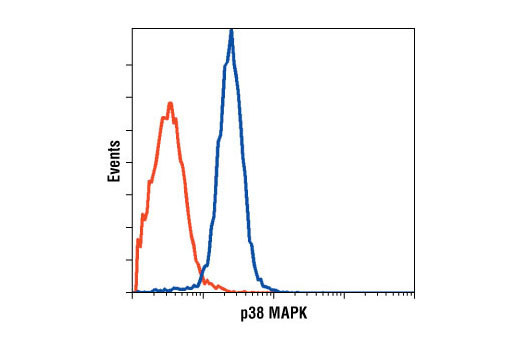 Flow cytometric analysis of Jurkat cells, using p38 MAPK Antibody (blue) compared to a nonspecific negative control antibody (red). 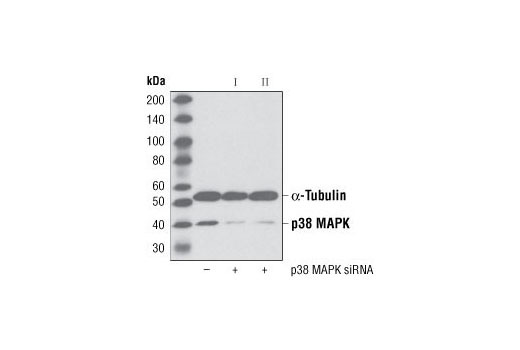 p38 MAP Kinase Antibody detects endogenous levels of total p38α, -β or -γ MAPK protein. 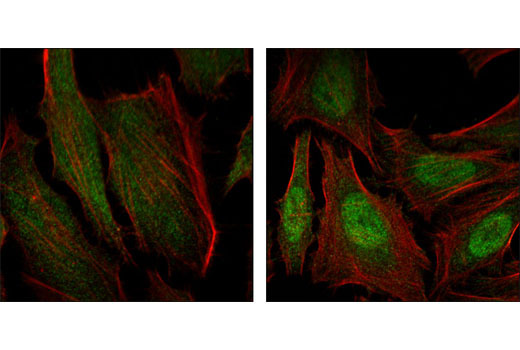 This antibody does not recognize p38δ, JNK/SAPK or p44/42 MAPK. Polyclonal antibodies are produced by immunizing animals with a synthetic peptide corresponding to the sequence of human p38 MAPK. Antibodies are purified by protein A and peptide affinity chromatography.